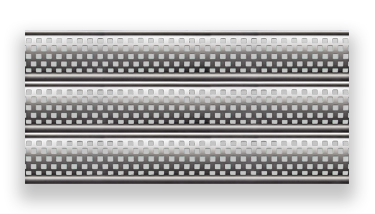 Security grilles are an excellent way to protect inventory, while maintaining visibility. Often used in kiosks, security grilles are a cost-effective investment. 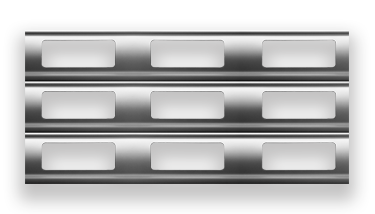 QMI is the only Alulux “Specialist Dealer” for window security grilles in the United States. Alulux is the industry leader in Europe. A German company, Alulux has a long history of quality engineering and design. QMI was selected to be the one and only dealer of Alulux in North America because of its impressive network of installers, and expertise in both commercial and residential security grilles and window security gates. 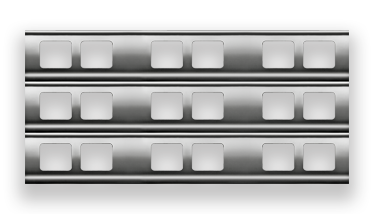 Extruded Aluminum slats with five continuous alternating rows of .25” x .25” punches removed provides excellent views through the shutter curtain, yet provides more security than linked gates using steel or aluminum tubing. The P-51 curtain is available in all 7 std QMI colors. The P51 is the most popular vision slat curtain as the small, multiple, holes enable excellent views (toward the greatest degree of light) and are very strong. Ropes or chains cannot be attached to the small holes and bolt cutters are too large. Linked gates with steel or aluminum tubing are vulnerable to bolt cutters. Extruded Aluminum slats with 1.75” x 1.5” punches removed provides excellent views through the shutter curtain, yet provides more security than linked gates using steel or aluminum tubing. Standard curtain color is anodized aluminum with any of the 7 std QMI colors available for the rails, box housing, and base slat. Extruded Aluminum slats with 4” x 1.5” punches removed provides near perfect views through the shutter curtain, yet provides more security than linked gates using steel or aluminum tubing. Standard curtain color is anodized aluminum with any of the 7 std QMI colors available for the rails, box housing, and base slat. Alulux security grilles may be mounted either on the interior or exterior surface of the storefront glazing. Some cities have ordinances requiring 70% openness on window security gates and grilles. New York City has such an ordinance to help reduce the surface area available for graffiti. Recently, a national pharmacy chain in New York City could not use the perforated or solid QMI shutter systems due to this new requirement. The Alulux CD900 was the perfect solution for this application. The first goal in retail security is to deter intruders from even attempting a break in. Interior mounted window security gates provide an additional layer that a criminal would have to find a way to get through. Often, a criminal will break a glass window or door to enter the business, thus setting off an alarm. A security grille creates another barrier between the merchandise, causing the intruder to flee before the police arrive. If it will take a burglar more than 2 to 3 minutes to enter a store, grab the merchandise, and flee the scene, most times they won’t even try. Watch this: Apple Store Smash and Grab video; you can see the burglars break the glass and steal more than $25,000 of merchandise in just 31 seconds. The full-time security guard is unable to stop the robbery and the store is wiped clean. No window security gates or rolling grilles were used to protect that store. Do you think the four burglars in the video would have even attempted this break in if an additional layer of security existed like QMI security grilles? Recently, one of QMI’s customers added storefront security grilles after suffering from four break-ins in their first four months of operation. It’s now been more than 18 months now since QMI security grilles were installed, and they have not even had an attempted break in. 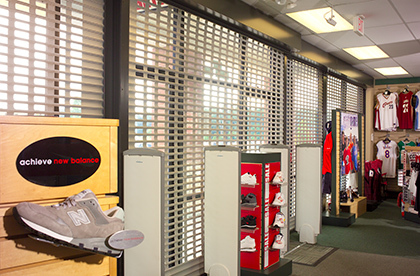 Watch the Retail Installation video to see how the shutters provide protection.